Searching for the perfect travel trailer to entertain guests as well as provide a second room/mid-bunkhouse, for the kids or grandkids? Your search is over when you enter this Best in Show LaCrosse! First you will see the private mid-bunkhouse with two bunk beds and a chest before looking at the main living and kitchen area. You will be amazed at the beauty of the rear entertainment center which offers side lite windows and hardwood overhead storage with glass inserts. The fireplace will keep everyone cozy while relaxing on the residential furniture. In the kitchen there is an island with a residential one piece farm sink and a stainless steel J-spout faucet, plus solid surface countertops. 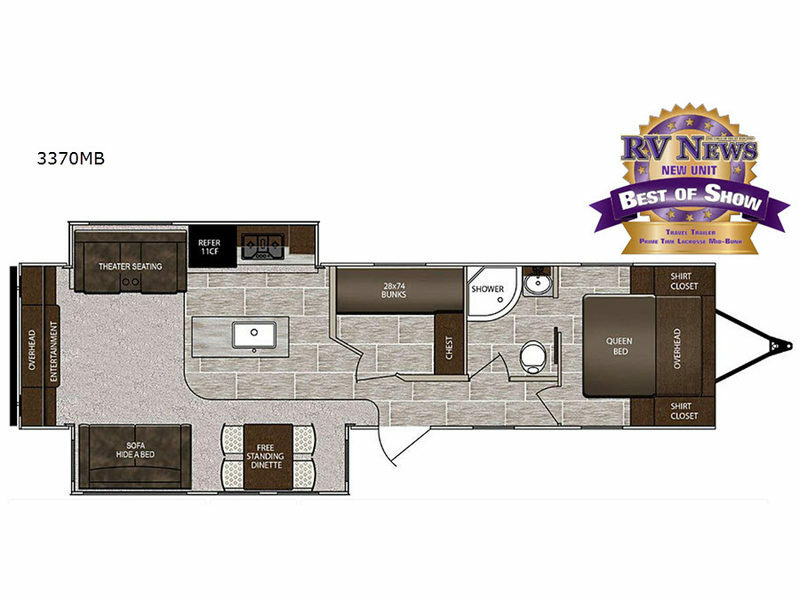 Take a look at the master bedroom and dual entry bath to complete your search! Wherever your camping adventures lead you, you will want a luxury LaCrosse travel trailer. Throughout each model you will find attention to detail from the shaker style cabinet doors, single bowl stainless steel sink, and residential J-spout kitchen faucet to the "One Touch" electric awning. You will find upgraded residential carpet with a pad, and in the living room there is an exclusive oversized MAX slide out offering nearly 40 cu. ft. of additional living space. MAX protection is found in the exclusive ETERNABOND construction which includes an enclosed and heated underbelly plus heated holding tanks and more. The mandatory Advantage Package includes the following - Universal Docking Center, electric tongue jack, a Furrion residential cooktop, solid surface countertops, a large stainless steel refrigerator, and so much more!